Five years ago, Erik Espinosa debuted Laranja Reserva, a brand named for the unique, orange-hued Brazilian wrapper that covers the cigar. (“Laranja” is the Portuguese word for orange.) The brand was well-received, garnering many scores of 90 points or better in Cigar Aficionado tastings, with the Laranja Reserva Toro being named the No. 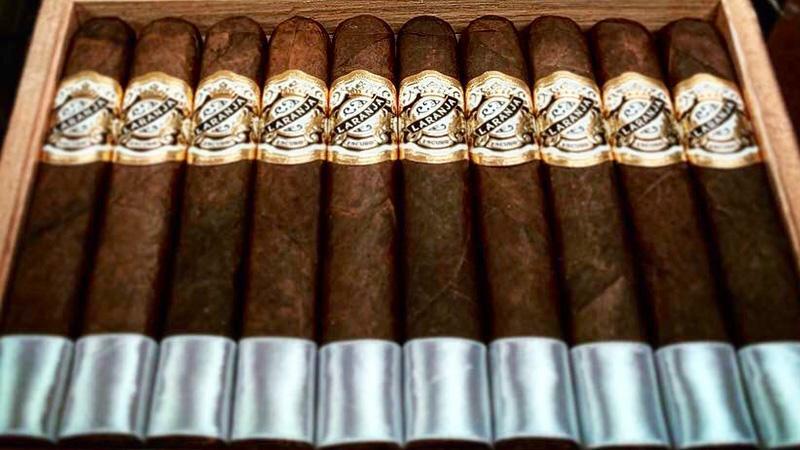 13 cigar of 2015. This week, Espinosa began shipping a Laranja line extension called Laranja Reserva Escuro. Laranja Reserva Escuro uses the same Nicaraguan binder and filler, but is covered in a dark, Brazilian Mata Fina wrapper. According to Espinosa, it was only natural that the folow-up be called Escuro, the Portuguese word for dark. Laranja Reserva Escuro comes in three sizes: Corona Gorda ($10), measuring 6 inches by 46 ring gauge; Robusto Grande ($10.50), 5 1/2 by 54; and Toro ($10.90), 6 by 52. The cigars are housed in 10-count boxes. Whereas the original Laranja is rolled at Espinosa’s La Zona Cigars S.A., Escuro is being made at A.J. Fernandez’s San Lotano Factory in Ocotál, Nicaragua.